At the beginning of a new year, it’s a great time to make a fresh start, turn over a new leaf, and enter a new season. Many people make resolutions for themselves and what they want to accomplish, such as lose weight, exercise consistently, or read a certain number of books. 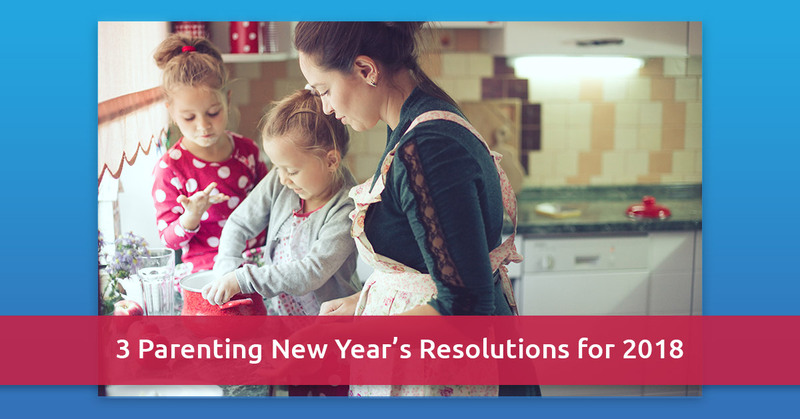 However, have you ever thought of making New Year’s resolutions for your parenting? Here are a few resolutions that can help your parenting to be better than ever in 2018. Where did 2017 go? You blinked your eyes and it is gone, and your child is a whole year older than they were last January 1. Blink your eyes again and they’ll be getting married, going off to college, or starting a job. Before that happens, resolve to enjoy every moment that you have with your child. They will only be this age once, and you’ll be glad for the rest of your life that you made every effort to enjoy them. Go beyond simply saying to yourself that you’ll spend “more time” with your child. Be as specific and concrete as possible. Look at your schedule and your availability, and determine what things you can juggle and what time you can allocate to personal time with this wee human that you love so dearly. Use the SMART acronym to create a resolution that you’ll actually follow through with. While many people are beating themselves up over not reading more books every month or every year, fewer people are thinking about whether their child is getting this boost to literacy, vocabulary, and interpretation of written works. But just think: kids’ books are much shorter than adult books, making this goal that much more achievable. Children who play outside on a regular basis develop their motor skills and movement abilities to a much higher level than children who are primarily indoors. If you can, find a place where kids can play on grass or mulch rather than asphalt or concrete. Encourage skills like running, jumping, and climbing. Bring a ball and play with it at your child’s level (roll it back and forth, kick the ball, throw and catch it, etc.). Going outside is not automatic in our daily lives any more, so it might require an effort to create a new habit. Find a good playground or outdoor area that’s nearby and easy for you to access. Plan time in your schedule for outdoor play, and treat it as a non-negotiable appointment. Make outside time fun by learning new games with your child. You’ll never regret all the times when you can be with your child. For the other times when you can’t, Rainbow Chimes is here to serve you with premier-quality day care in Huntington, NY. We look forward to meeting you! Start the enrollment process by contacting us.